Budget skincare can be a bit hit and miss for me, however I've tried some really great products that cost under £10 and I thought I'd share those with you today. I'm never sure whether to include lip care in with skincare but this is too good not to mention. I'm not sure why it took me so long to give it a go but now I have, I'm converted! It's a thick, fairly solid formula that I apply just before bed. By the next morning my lips feel soft, nourished and smooth. This is potentially the best value product out of the lot as the bottle just lasts forever (it’s basically the same size as their body moisturisers!) It’s a cream/lotion cleanser that works really nicely for removing makeup. It’s gentle even on the eyes, though it does have a light fragrance. I’ve actually had the Origins Clear Improvement mask for ages but only got into using it relatively recently. However this mask from Quick Fix is extremely similar for a fraction of the price. I want to say that the Origins is a touch more effective and my skin feels nicer afterwards but there could be other factors affecting that. All in all this is a great charcoal mask to use around about once a week to clear up blemishes and maintain a good complexion. For ages and ages I really wanted to try the Hot Cloth Cleanser from this range but now I’ve given both a go, I think I actually prefer this! It’s just so ridiculously effective and gentle for removing makeup. It’s not too heavy and although it is moisturising, I don’t feel like there’s excess oiliness left behind after use. The only downside it having to shake it up before use because it separates back out really quickly! Anything Tea Tree is ideal for blemishes and this oil treatment is perfect for leaving on overnight to the affected areas. It’s completely non-drying but it somehow reduces the size and redness of any spots by the time I wake up the next morning. My absolute favourite, Bioderma, has increased slightly in price so unfortunately no longer comes in at under a tenner. However this offering from Simple does! I’ve included this over the Garnier version because personally I think it’s a lot better. It’s so gentle and doesn’t contain any harsh ingredients, however it’s still almost as effective as the Bioderma. If I can’t get my hands on the Bioderma then this is what I go for. Ok, so this isn’t a product that’s going to change your life all by itself but it’s still a vital part of my anti-blemish routine. A quick spritz after cleansing in the morning and evening mattifies the skin and reduces any redness and soreness from blemishes. This is an unusual product as it's not what you'd expect from a drugstore 'scrub'. There are small, fairly smooth exfoliating particles in this so it isn't rough at all. It also contains chemical exfoliants. I put a bit of this on my t-zone for a couple of minutes before rinsing and the area looks brighter, less oily and my pores more refined. I know everyone harps on about the Beauty Elixir but that Cult product has a much cheaper little sister that I actually prefer. This doesn't really contain anything other than grape juice but it's so incredibly hydrating and refreshing. If I've just used an intense treatment or my skin is looking a bit dehydrated or lacklustre then a quick spritz of this fixes it. No skincare post of mine would be complete without mentioning this! If you suffer from acne, scarring and breakouts then this is perfect for you. It has a nice lotion texture, so although it's a clay mask it isn't too thick and drying. It's a 5-minute treatment so you can really feel it working! However for me it's well worth it as my skin looks immediately brighter and less oily and by the next day I can definitely see impressive results in terms of reducing redness and breakouts. What are your skincare favourites under £10? The Una Brennan mask sounds like it would be perfect for my skin, and now thanks to this I have a wishlist of more skincare to buy! At least it's all under £10! I need to try the Nuxe Rev de Miel lip balm - it seems like such a good lip product! I really need to try that Nuxe Rev de Miel lip balm, the amount of good reviews I have heard about this product!!!!! I really wish we had Una Brennan in Aus, all the reviews sound fantastic. Liking the sound of the Una Brennan mask! I have the Caudalie Grape Water in my stash unopened, excited to give it a try now! 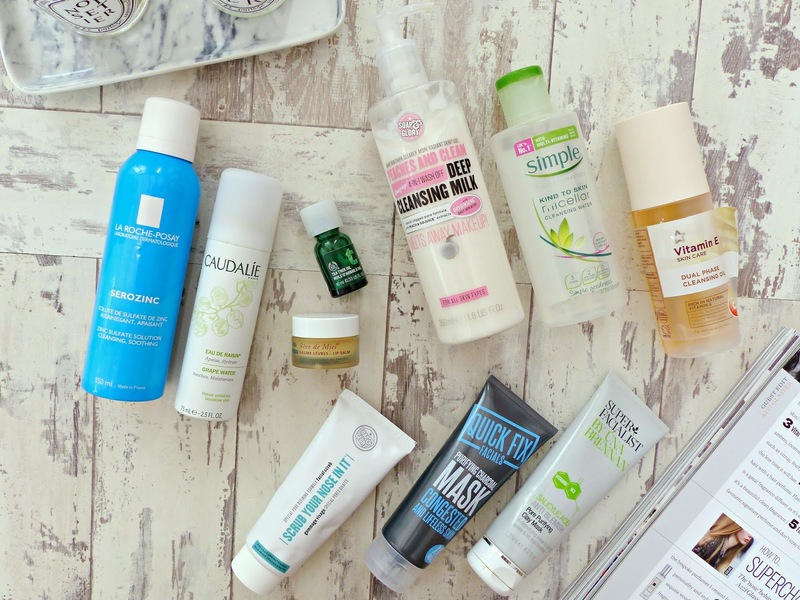 I love this post, so many products for me to look out for on my next trip to Boots :) Think I'll definitely be grabbing one of the Soap & Glory Cleansing Milks, those bottles last for-bloody-ever! Lovely picks! I'm going to keep my eye out for some of these as I love trying new things out! Love the Nuxe lip balm! So good! Still never tried anything from the Una Brennan range but that mask sounds so perfect! I will definitely be trying it out! All products from Simple look like a very good spend! I really love Serozinc and the Scrub Your Nose In It mask too. Great round up, I need to find a way to try and get my hands on that Serozinc in Aus! Such a fan of the Nuxe lip balm too, my current Dior Creme De Rose is running out so I might need to go back to using trusty Nuxe. The Superdrug Vitamin E Cleansing Oil sounds great! I'm going to their AW15 press day tomorrow - definitely looking forward to seeing all the new ranges! I can't believe how big the bottle of the S&G cleansing milk is! It sounds brilliant! L'Oreal's Miracle Cleansing is great for removing remainders of makeup and leaves my skin so soft! I love tea tree oil! Its so soothing for the skin and really helps with dark spots/scaring which I sometimes get:( The soaps and glory cleanser sounds fab! Great post! these are all great steals!! I need to repurchase the Una Brennan mask, it's incredible! The La Roche Posay Serozinc is a game changer personally, so good! Great picks, I love the Soap & Glory nose scrub, it's brilliant! I've heard many good reviews on this Soap & Glory scrub and I think I will finally buy it. And this product sounds perfect for my oily t -zones problems! Enjoyed reading these. I think you've intrigued me into picking up Superdrug Vitamin E Dual Phase Cleansing Oil as I've been considering trying a cleansing oil for a while. Nuxe Reve de Miel Lip Balm has been on my wishlist for a while!